We regularly see reports that show Android is leading the mobile market, but this is the first time I’ve seen a state-by-state breakdown of popularity. 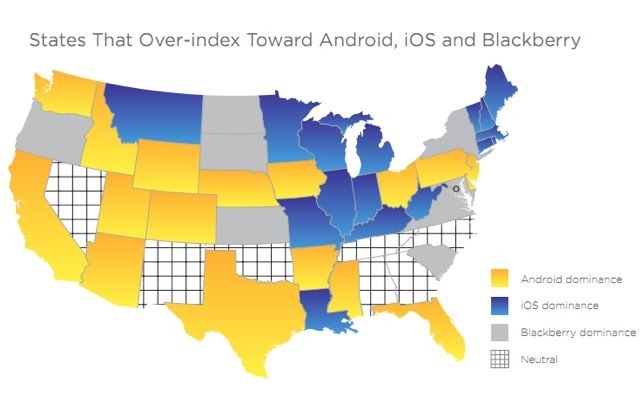 Jumptap, a mobile ad network, released a report today showing Android, iOS, and BlackBerry popularity at the U.S. state level. The data is based on activity on Jumptap’s network, a network that reaches 83 million users. This entry was posted in News and tagged android, blackberry, graphic, iOS, mobile popularity, stats by David. Bookmark the permalink.